Reliable, long lived and easy to grow, hardy ferns are tolerant of cold winter temperatures and can be grown outdoors year-round. 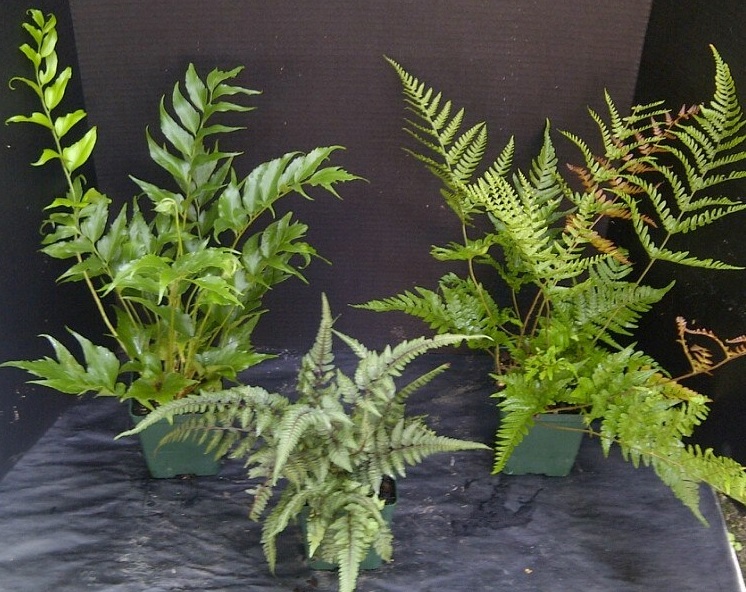 Adaptable and versatile, hardy ferns can be used as border plants or in containers and even for erosion control. Most ferns do require a moist, shady spot to perform well. Hardy Ferns add textures to any shade garden. Fern care is easy when planted in moist, humus rich, and well-drained soil. PLANTING: Space plants according to the ultimate size of species you have chosen. Most hardy ferns prefer a shady or partly shaded location protected from the sun and hot, dry winds. Soil should be light or loose and highly organic. Take care not to plant crowns too deep, set them at or just below soil level. Mulch at planting time, and make sure plants have ample water during the spring and early summer, particularly during the first few years, when plants are establishing themselves. MAINTENANCE: We recommend that no fertilizer be used on hardy ferns; mulching will provide enough organic matter. It's best not to disturb the duff (the layer of decaying vegetation that covers the soil around the plant). Overhead spraying from time to time is beneficial. Divide as necessary by separating the rhizomes, this should be done before new growth begins in the spring or, preferably, as plants go dormant in the fall. Good irrigation practices are essential when growing ferns. It is best to water early in the day to allow the fronds plenty of time to dry before nightfall. Allow the soil to dry slightly between waterings. Ferns can be sensitive to high salt levels incurred from commercial fertilizers. Use about half of the amount of fertilizer you would use with other perennials.